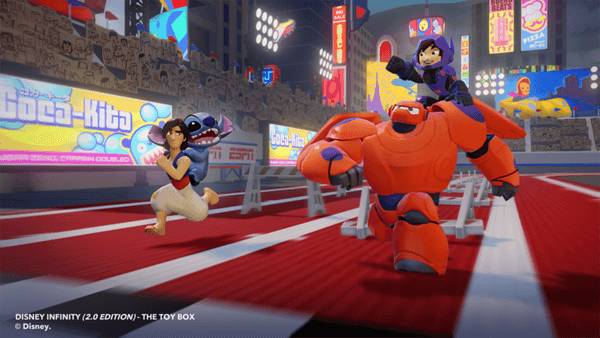 Big Hero 6 is this year’s big outing from Disney, so I don’t think anybody was surprised when they announced that the film’s stars; Hiro and Baymax would be joining the Disney Infinity roster as part of the Disney Infinity 2.0: Disney Originals range. 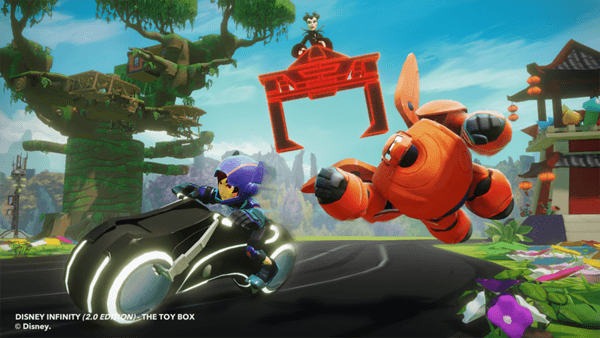 Although they are only playable in the Toy Box Mode, Hiro and Baymax really do make a big impact and are a tonne of fun to play. Firstly we will talk about Hiro. After seeing the movie, I wasn’t quite sure how Hiro would translate across to the Disney Infinity world (seeing as he doesn’t really have any powers or special abilities/attacks in the film). However, I was pleasantly surprised with how well they made his character. Hiro attacks by using his Microbots to create waves and pillars that can hit enemies from quite a distance away, and pack quite a punch. The animation effect that the nanobots make as they unfurl into an enemy is unique and really helps Hiro stand out as a worthwhile character. Baymax on the other hand is a character of raw power. Armed with his red/purple armor from the film and a bevy of karate moves, Baymax can absolutely crush entire hordes of enemies. His strength rivals that of The Hulk and Venom, and he is the only of the game’s big beefy brawlers that has access to the flight ability. Baymax also comes equipped with his signature rocket fist attack for firing at enemies from across the battlefield. 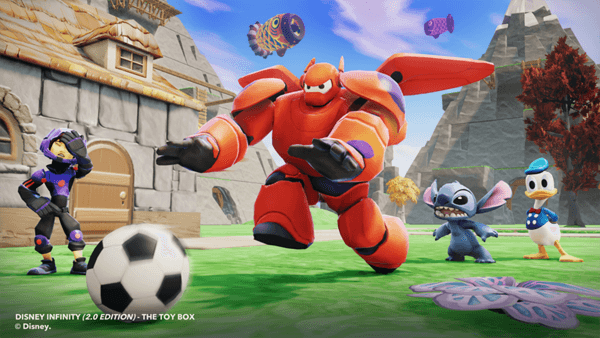 If you are ever looking for a character to steamroll your friends in a multitude of challenges, then Baymax is definitely the one to slap down onto the base. Since Hiro and Baymax have a special bond in the movie, the guys over at Avalanche Software did this justice by implementing a similar unified power for the two in the game. In much the same way that Rocket Raccoon can jump onto the back of Groot and fire his blaster, Hiro can magnetise himself to Baymax’s shoulders, and attack enemies while the red medical assistance robot flies around the map. This is arguably more powerful than the Roccet/Groot team-up as Baymax’s flight is no joke. Visually, the two figures look almost identical to their movie counterparts, with little aestetic changes made. Hiro is donning his purple superhero suit, and as mentioned above, Baymax is wearing his red/purple armor. The colour combination of the two characters contrast each other nicely, and the detailing, while not perfect is still quite nice. Little touches like Baymax’s CPU slot appearing on the figure, or Hiro’s utility belt really show the effort that Disney is putting into these figures. One thing I will note is that I wish the Baymax figure was just a little taller. In the Big Hero 6 movie, Baymax absolutely towers over the other characters, but here he is around the average height. It is a minor problem, but one that I feel detracts from the overall look of the figure (especially when put next to Hiro). Powerful, accurate, fun. Three words that sum up the Hiro and Baymax Big Hero 6 figures perfectly. 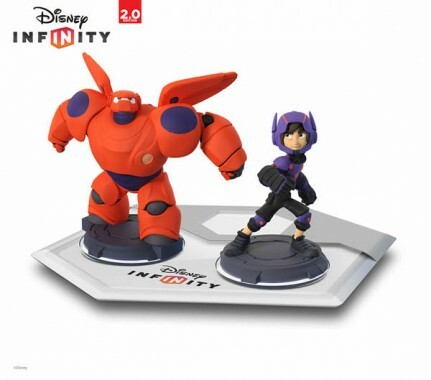 It is a little disappointing that like the other Disney Originals range, these two didn’t get their own Play Set, especially because Big Hero 6 would have been the perfect franchise to tie the Marvel Super Heroes in with the Disney Originals, but I’m holding out hope that this will change in the future. For now, they are great additions to the Disney Infinity family, and awesome characters to slam down onto the base and play around with.